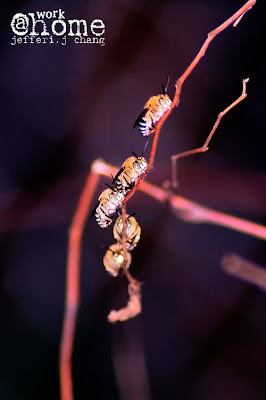 I don’t really know what species are this bees. I actually plan to take some lizard but ended up taking bees instead. I have to use a tripod, high shuttle speed around 1/400 and external flash with diffuser box. Even with the setting, the photo still look a little bit blur and noise. 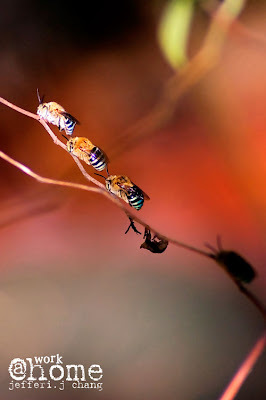 I used my zoom lens 70-300mm lens to capture this tiny bees. It actually look smaller but i crop and make it bigger, enhances the colors and sharpen it using photo shop. The result turn out to be nice. I wonder what it would like if i took it using macro lens. The photo must be look nice with the overwhelming details if shot only one bees and hope that they will not fly away or sting you back.